A familiar refrain accompanied the Philadelphia Eagles’ unlikely trek toward Super Bowl LII. It was perhaps best explained by Ed Rendell. Predicting an Eagles victory, Rendell said, “This team reminds me of the 1993 Phillies, just a bunch of working stiffs, not glamourous whatsoever. So blue-collar.” Rendell was uniquely qualified to comment on the Phillies and Eagles. A Philadelphia sports super fan and former politician who co-hosted an Eagles postgame show while serving as governor of Pennsylvania, Rendell was also the mayor of Philadelphia when the Phillies made their World Series appearance in 1993. Although the team suffered a heartbreaking loss to the Toronto Blue Jays when Joe Carter hammered a walk-off home run in game six, the Phillies still secured their place in local sports lore. After finishing dead last in the National League East the previous season, they left few fans with high expectations as the 1993 season began. Yet they won the National League Championship with a roster that included only a few big name stars and an even greater number of slovenly-looking players with an allegedly heavy drinking regimen. 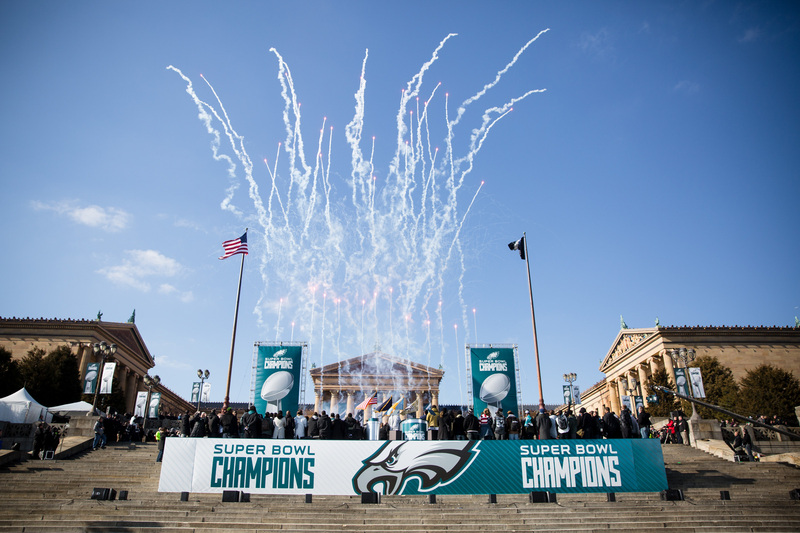 Local sports writers affectionately dubbed the team the “Broad Street Bellies.” Ed Rendell invoked a deep strain of local sports culture and civic identity when he compared the 2017 Eagles to the Broad Street Bellies. More than that, Rendell asserted that the Eagles’ blue-collar identity was also key to their first Super Bowl victory. Governor Tom Wolf Attends Philadelphia Eagles Super Bowl LII Victory Parade. Images from Wikimedia Commons. Rendell was hardly alone in that assertion. Writing for the Weekly Standard, Jonathan V. Last offered “Five Reasons the Philadelphia Eagles are America’s Team Now.” Number one: Compared to their Super Bowl opponent New England Patriots, “the Eagles are blue-collar workmen.” Even a Boston-area blogger framed the game as “The NFL’s Super Villain vs. the Blue-Collar Underdog.” After the Eagles upset the Patriots 41 – 33, even the New York Times claimed that “No team idealized Philadelphia’s view of itself as the Eagles did—the gritty, blue-collar, Rocky-esque, good but not quite good enough.” The article also questioned whether Philadelphia could maintain its self-image after winning the Super Bowl. But by conflating recent losing records with a long-ingrained sense of civic identity, the Times misjudged the depths of that identity. They also deprived it of its complex political and cultural meaning. Blue-collar identity was never solely the result of losing. In fact, it first grew out of a series of victories. Philadelphia’s blue-collar civic identity was the result of complementary shifts in the city’s political and sports culture at a pivotal point in the city’s history. Like a handful of other urban civic identities, Philadelphia’s blue-collar identity is often touted as a defining characteristic of the city and its culture. It invokes a hardscrabble, working-class ethic that promotes toughness, sacrifice, hard work, and tradition. When extended to the city’s professional sports culture, the blue-collar label signifies a shared commitment to these values and reimagines sports franchises as the ambassadors of the city’s civic identity. As evidenced by the commentary before and after the Eagles’ Super Bowl victory, the narrative of the blue-collar city has become ubiquitous to the point of cliché. While it is most often invoked in the context of Philadelphia sports, its roots lay just as much in the city’s social and political history. Examining how Philadelphia became a “blue-collar city” reveals the term’s cultural and political meaning beyond the perfunctory references that accompany sporting events, but also how professional sports helped establish, maintain, and redefine that civic identity. Philadelphia’s blue-collar identity emerged out of a transitional point in the city’s history, in an era steeped in the mid-twentieth century city’s watershed conflicts over race, class, and politics. It fully took hold as the city emerged out of the tumult of the 1960s. To be sure, the city had a much longer history of industrial work, strong labor unions, and the kind of tight-knit urban neighborhoods that fostered a specifically working-class culture, but the idea that blue-collar culture represented the city was a product of the 1970s. Prior to that, the city’s civic identity was defined by its patrician class and more emblematic of Philadelphia’s Main Line than its row home neighborhoods. That image began to change as an assertive political and cultural shift in white, blue-collar politics arose in response to a series of challenges to the city’s white, blue-collar traditions and institutions. As historian Jefferson Cowie has argued, the 1970s were “the last days of the working class.” He also argues that despite an increasingly diverse working class, the cultural idea of a blue-collar worker was primarily white and male, so much so that “[b]y the 1980s, ‘working class’…had evolved into a label for a hardened form of white, male identity politics.” As I further show in my own work on Philadelphia in the 1970s, blue-collar identity politics also became a chief means of obfuscating racial and gendered language in debates over liberal and civil rights policies like school desegregation, public housing, and affirmative action. As explicit appeals to white privilege became publically taboo, whites across the United States began adopting “color-blind” discourses. But where middle-class suburbanites and neoconservative intellectuals extolled the virtues of meritocracy to dispute racially inclusive housing, education, and employment policies, working- and middle-class whites in cities like Philadelphia pointed to their blue-collar identities as a means of avoiding racial dialogues. For example, when civil rights activists forced the Pennsylvania to issue school desegregation guidelines for Philadelphia, blue-collar whites responded not with calls for whites-only education but appeals to the sanctity of their neighborhoods. When a South Philadelphia community activist protested a desegregation plan, she told a Board of Education hearing that her local neighborhood school had “served the children of longshoremen, firemen, policemen, and other working people for generations.” Keenly aware of accusations that communities like hers were racist, she further explained that her community’s opposition to the desegregation plan was not about race, but the value of her neighborhood’s “closely knit community.” At the same time, as civil rights activists pushed for more affordable housing options for poor people of color, another white, blue-collar South Philadelphia neighborhood sustained a long and acrimonious fight over the construction of a public housing project. They too adopted the ostensibly color-blind language of blue-collar neighborhood sanctity. Community leaders insisted that their opposition to the public housing complex was not the prospective race of its tenants, but that its occupants would not have earned their homes through “hard work.” As one community representative explained, “when people get something for free they treat it like junk.” But, conscious of the public perception, she added, “We’re not racists. Why, we had good colored people living here until the city took their houses.” This turn toward blue-collar identity politics to avoid discussing the racial implications of educational or housing policies not only represented a shift in white working-class politics, it also strengthened a local cultural identity that found expression in the city’s sports culture and laid the groundwork for Philadelphia’s renewed civic identity. 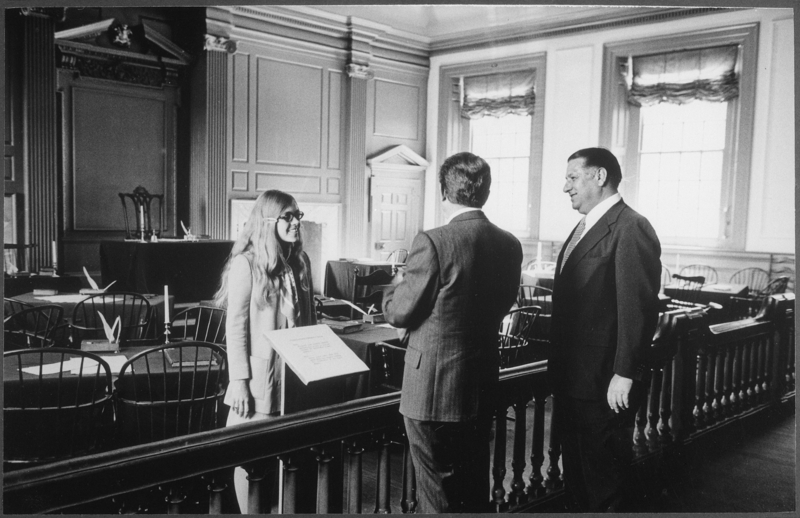 President Nixon tours Independence Hall in Philadelphia, Pennsylvania, with Mayor Frank Rizzo, October 1972. Image from Wikimedia Commons. Somewhat ironically, the rise of blue-collar identity politics coincided with a decline in Philadelphia’s blue-collar economic base. Like cities all across the country, deindustrialization, industrial flight, and a declining national economy wreaked havoc on traditionally working-class jobs. Local industries had been searching for lower taxes and cheaper workforces in the union-weak suburbs or Sunbelt South for decades. By the 1970s industrial relocation began to sap the city’s manufacturing strength. Likewise, while record-high federal spending in the Philadelphia area had made construction work one of the most lucrative blue-collar employment options in the 1960s—so much so that it set off a confrontation between civil rights activists and white construction unions over equal opportunity employment that led to the enactment of the nation’s first fully-formed affirmative action program, the so-called Philadelphia Plan—the sagging economy of the 1970s ended several large-scale public works projects. Even as Frank Rizzo and his blue-collar supporters represented the ascendancy of blue-collar identity politics, the Rizzo administration oversaw the reinvention of the city’s economy. While Rizzo spent the 1970s attacking programs like public housing and affirmative action that he said gave “special privileges” to nonwhites, his team of talented economic advisors attracted new businesses and established policies that helped transform Philadelphia into a center of the health care and pharmaceutical industries. The city was in the midst of shifting from a reliance on light industry and manufacturing to a more white-collar and service sector economy. Frank Rizzo might not have been able to declare Philadelphia a “blue-collar city” if not for the rise of an equally powerful blue-collar ideal in the city’s sports culture. Drawing inspiration and identity from the city’s professional sports teams was nothing new for Philadelphians in the 1970s. The triumphs and setbacks of the Phillies and Eagles had long taken on larger social and cultural meaning. By the 1970s, however, both teams had suffered years of losing records that left fans disgruntled, perhaps best represented by the infamous incident at the end of an especially disappointing 1969 Eagles’ season when Philadelphians booed and pelted Santa Claus with snowballs. While that particular story is much more complicated than the one sports announcers drum up whenever they want to lampoon Philadelphia fans, it nevertheless hints at the passion behind the city’s sports fandom in the 1960s and 1970s. By then, however, a new obsession rose to win the loyalties of Philadelphia’s blue-collar sports fans: the Philadelphia Flyers. 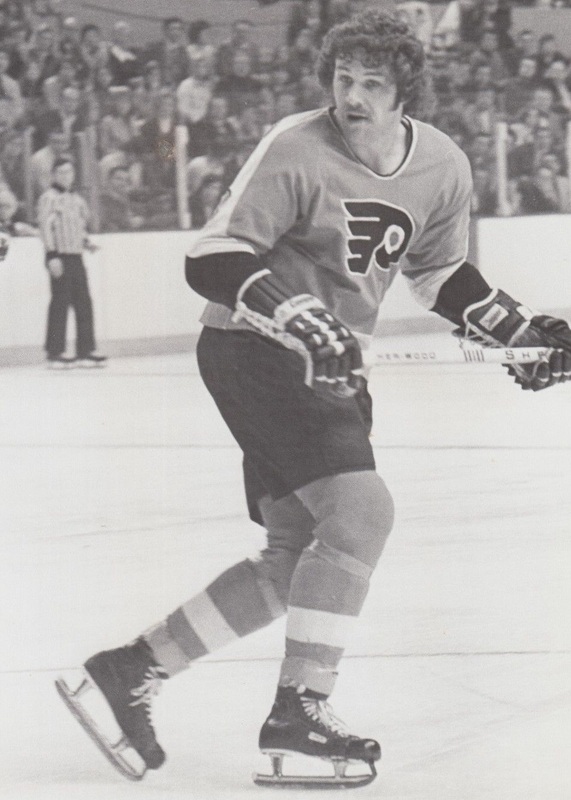 Dave Schultz playing for the Philadelphia Flyers during either the 1972–73 or 1973–74 season. Image from Wikimedia Commons. No team represented Philadelphia’s blue-collar culture more than the Broad Street Bullies. Their style of play established that, but so did their off-the-ice antics. The team built a culture of comradery intended to make them as close-knit as any blue-collar neighborhood. They often gathered together at Rexy’s, a watering whole just across the Delaware River in Cherry Hill, New Jersey. According to hockey historian John Wong, “Rexy’s became a second locker room for the players where they could live and behave in a hypermasculine world.” Fans could see their local sports heroes living their team culture. For a time, that relatability made the Flyers the most popular professional sports team in Philadelphia, especially among blue-collar whites. Like they did with Frank Rizzo, blue-collar whites identified with the Flyers because they could see a bit of themselves in the team. The overwhelming whiteness of hockey also reaffirmed the racial subtext of blue-collar identity politics, but without explicitly saying so. Further, in an ultramasculine sport that rewarded violence, the Broad Street Bullies exemplified the equally significant gendered connotations of blue-collar identity. More than that, they became real-life blue-collar heroes when they twice won the Stanley Cup in 1974 and 1975. When the city threw a parade after their first championship, they were accompanied by blue-collar whites’ other local hero, Frank Rizzo. The Broad Street Bullies’ success validated the city’s blue-collar culture and helped solidify the new identity Rizzo represented. The Broad Street Bullies offered a triumphant symbol of Philadelphia’s emerging civic identity, but they were not alone. On the heels of their success, another figure emerged to epitomize that identity and culture on an even broader scale. The release of the 1976 motion picture Rocky introduced the most iconic and longstanding symbol of the city’s identity and sports culture. The movie captured the feel of the Philadelphia’s blue-collar neighborhoods better than any other cultural product of the era. An indelible product of those neighborhoods, the movie’s title character was a walking, talking blue-collar stereotype. Rocky Balboa lived in a never-specified working class neighborhood. He trained at a run-down gym in a run-down neighborhood underneath a run-down elevated train. It was this background that set the tone for Balboa’s floundering boxing career and the one-in-a-million shot at the heavyweight title that drove the film’s plot. Philadelphians fans know the scene from Rocky II without the deeper context. It resonates because Rocky has become as much a part of Philadelphia’s sports culture as any real athlete. As a result, everything about the display of this scene—as well as the Rocky training montage intercut with Eagles’ highlights played over the Rocky theme song that follows—reinforces the blue-collar civic identity that Rocky Balboa, the Broad Street Bullies, Frank Rizzo, and his blue-collar supporters established in the 1970s. The 2017 Eagles’ activism culminated with several players refusing to attend the traditional Super Bowl victory celebration at the White House. When Donald Trump subsequently disinvited the entire team, he highlighted the complicated evolution of blue-collar politics. Throughout his campaign for presidency, Trump invoked a number of blue-collar tropes and imagery. At a campaign stop in Pittsburgh, Donald Trump Jr. referred to his father Trump as a “blue-collar billionaire.” Trump even drew a number of comparisons to Philadelphia’s old blue-collar hero, Frank Rizzo. After winning the election, Trump continued invoking these images by promising to bring back traditionally blue-collar jobs that had long succumbed to automation and staging photo ops with bikers, truckers, and other blue-collar archetypes. By the time the Eagles made it to their first Super Bowl, Trump had become the new symbol for the kind of blue-collar politics that had emerged in the Eagles’ home city during the 1970s. Despite this shift, local figures like Ed Rendell and national publications like the New York Times still invoked Philadelphia and the Eagles’ blue-collar identity. Perhaps the Super Bowl champion Eagles are evidence that the city’s blue-collar sports culture has separated from its blue-collar politics of the 1970s. Or maybe the connotations that allowed Philadelphia to become a “blue-collar city” have dissipated in the ensuing decades. In either case, however, as long as people continue to refer to Philadelphia and its professional sports franchises as “blue-collar,” they will be invoking a civic identity that emerged out of the intersection of local political and sports history. It is a shared history that has created a lasting if complicated and often contradictory legacy. Blue-collar identity, then and now, is steeped shifting political and cultural meaning. The New York Times may ponder whether Philadelphia can maintain its blue-collar identity, but it is likely that it will remain as common as the stock footage of cheese steaks and the Rocky statue that accompany every sporting event nationally broadcasted from the city. It would be better to ask what we mean when we call a city or a team “blue-collar. Timothy J. Lombardo is a Philadelphia native, Philly sports fan, and Assistant Professor of History at the University of South Alabama. His first book, Blue-Collar Conservatism: Frank Rizzo’s Philadelphia and Populist Politics, will be published by the University of Pennsylvania Press on September 25, 2018. You can follow him on Twitter. Blue-collar whites foreground a specifically white and male political identity, but as these examples show blue-collar women were also an important part of blue-collar politicization. As women took on leadership roles in blue-collar battles over housing and education, their toughness and protectionism became key parts of blue-collar identity even as their political language highlighted a decidedly male blue-collar ideal. Great insight, worthy article! Thank you!